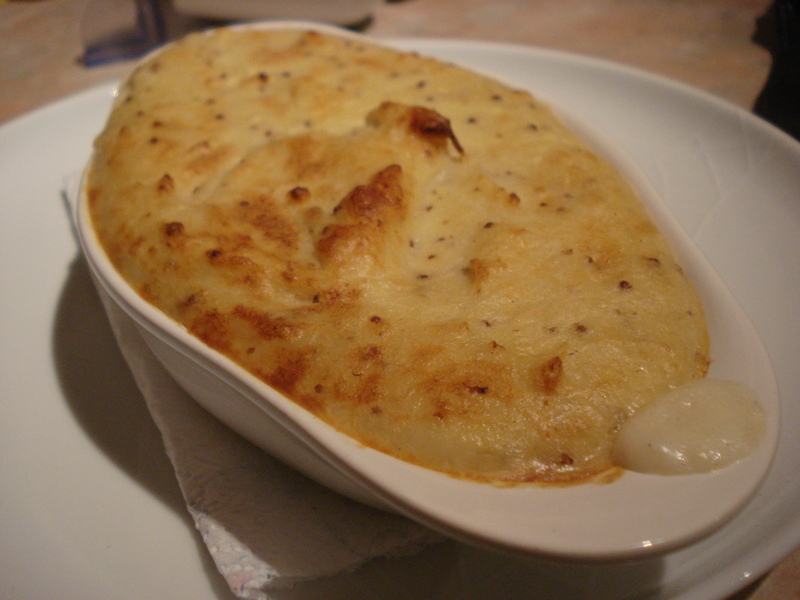 During his TV series In Search of Perfection Heston Blumenthal crafts his perfect fish pie. I love a good fish pie, and I’m sure this one is superb although as with many of his recipes it requires oddities, not limited to oyster juice (? ), hay-smoked haddock and agar-agar powder. I don’t quite fancy this level of faff, but recall that during the TV programme the potato topping he made sent him quite giddy. His face said “turn that camera off and I will eat the whole bowl of this right now”, so I thought I’d lift the mash on to a more basic fish pie recipe. I turned to Marcus Wareing’s, as featured in a Guardian round-up of student recipes. The fish filling was smooth and comforting with lovely smoked haddock and the refreshing bite of peas. But the mash was something else. Almost milkshake-smooth with a lovely savoury tang – it comes highly recommended. It’s nowhere near as complex as some of his recipes, so give Heston Blumenthal’s potato purée a whirl. To make the filling, bring half the milk with bay and thyme to a gentle simmer. Add the haddock and poach gently until cooked through, about 6 minutes. Put the fish to one side and discard the milk. Melt the butter into a saucepan and add the flour. Use a wooden spoon and beat into paste. Allow to cook for a minute or two and gradually add the rest of the milk until it forms a lovely smooth sauce. If it’s not looking great, turn up the heat and go mad with a whisk. Determination will pull it together. Continue to stir for another few minutes to thicken. Season and grate over a few strokes of nutmeg. Remove from the heat and stir in the peas. Flake the haddock in (good chance to get rid of the bones here). Pour into the dishes you will eventually cook them in and leave to cool – this will let the mash sit on top a little happier. For the mash, rinse the potato slices in plenty of cold water to remove excess starch. Boil in 80°C simmering water for 30 minutes, then drain and cool the slices under cold water. Put into boiling water, salted this time and simmer for 15 minutes until completely soft. This two-stage process ensures it is cooked completely through and avoids the possibility of a grainy purée. Drain the potatoes again, pop them back in the pan and let them dry thoroughly by shaking over a low heat. Preheat the oven to 180°C. Place the butter in a bowl. Pop a fine sieve over the top and using a spatula force the potato through the sieve, then fold through the butter. Simmer the milk in a pan and incorporate the buttery potatoes. Add the remaining ingredients over this low heat and check for seasoning. Pipe the mash over the top of the pie and bake in the oven for 20 minutes or until the potato is lightly browned on top. This entry was posted in fish, peas, potatoes and tagged heston blumenthal, marcus wareing on October 14, 2010 by Gary. Wow looks yummy! 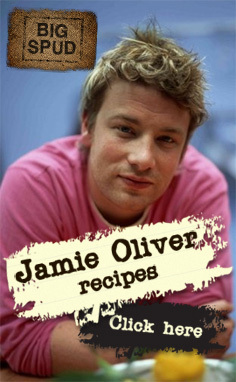 As you quite correctly pointed out it does not look as complexed as some of his recipes! Pingback: Need a vegetarian one pot dinner recipe please.? Excellent post and great blog. Had a go at making the mash potato topping the other night for a shepherd’s pie (a poor copy of the umami BA one). How did you find cooking the potatoes? With a bit of experimentation I could hold the temp at a steady 70. I’m not sure if it’s that first simmer to lock the starch, undercooking them the 2nd time or not using charlottes, but they were rock hard when I came to push them through the ricer (and murder to get through the sieve). The sieving did save the day thankfully, but did you experience anything similar? The only reason it could be that hard is if they are undercooked. Note my recipe (transcribed from the book) talks about 80°C. Try that next time! Give it a whirl and let me know how you get on. (Looking forward to your blog!). I’m off to stick some seaweed in my mash. 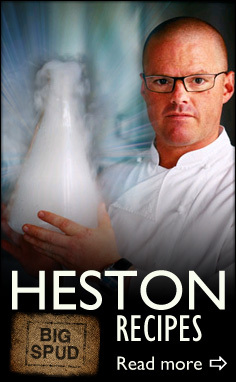 InSearchOfHeston up there has started a great new blog, go and try it now. Thanks for the feedback and advice. Brilliant to have a passionate food adventurer like yourself to discuss recipes with. You might regret it when I’m asking about the state of chicken thighs at 60 degrees though! In all seriousness, next time you try a beef or lamb one-pot dish please, please have a go at throwing in as many umami ingredients as you can. Even the sushi nori if you can find it (mine was some old stuff I picked up at Oriental City for 70p, and to be honest casseroles are all it’s good for now – Oriental City closed in 2008!) . I promise you the results will be worth it & be excellent to read your take on it. I will definitely give this a whirl. 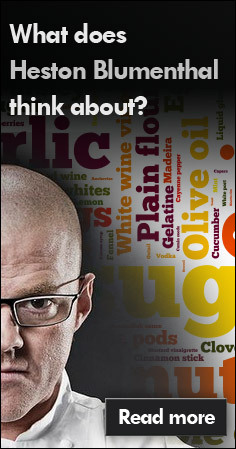 I am preparing something Heston-inspired this weekend, I think you will like it!